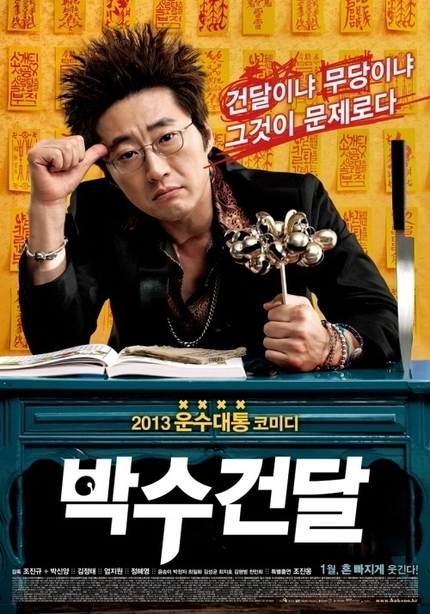 Currently smashing up the Korean box office with high grossing success is the gangster comedy Man on the Edge. It seems director Jo Jin-Gyu will continue to tread familiar ground in the Kkangpae - Korean gangster - world, as he has since the hit My Wife Is a Gangster series. As with those previous films, this will feature a mix of action and comedy but with a supernatural twist. Strange things begin to happen to Kwang-ho (Park Shin-Yang), a famous mob in town, after he is stabbed in the hand during a fight. He concludes that the path of a shaman is the only solution to his problems, and juggles his vocation as a mob by night and his new role as a shaman by day. He's now known as 'veiled shaman' and even ghosts visit him for help. While Kwang-ho leads a dangerous double life, he begins to sympathize with a child ghost named Su-min. When Kwang-ho is about to help Su-min, his cover is blown and is attacked by a rival gang. Will Kwang-ho be able to fulfill Su-min's wish? You'll find the trailer (English subtitled included) embedded below.